Oh where does the time go? 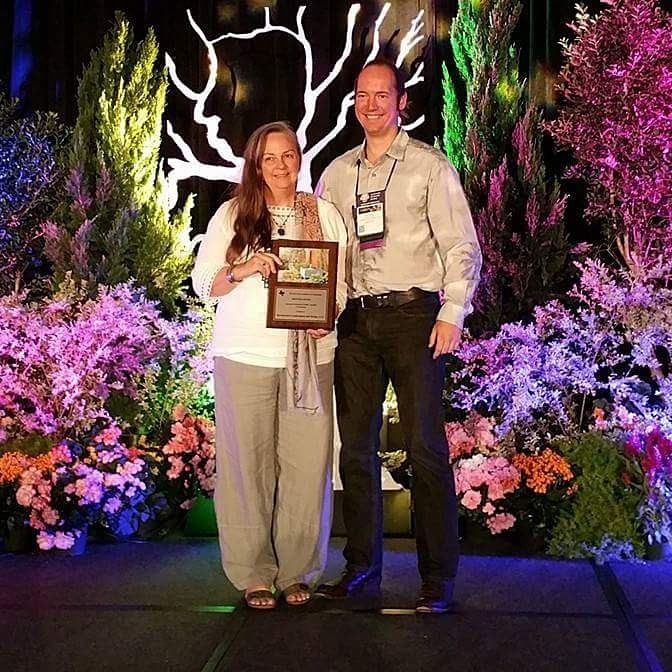 I have been wanting to blog about this garden since January. Unfortunately just after Christmas our downstairs A/C broke and we had to replace it. That was the beginning of a landslide that we still haven’t seen the end of. The A/C is built into the middle of the house. Getting it replaced meant taking down wall and while we were at it re-running duct work etc. This gave us the opportunity to update and remodel two bathrooms. One is done the other is in the works. So blogging was put on a back burner as I acted as GC. Now back to the garden. 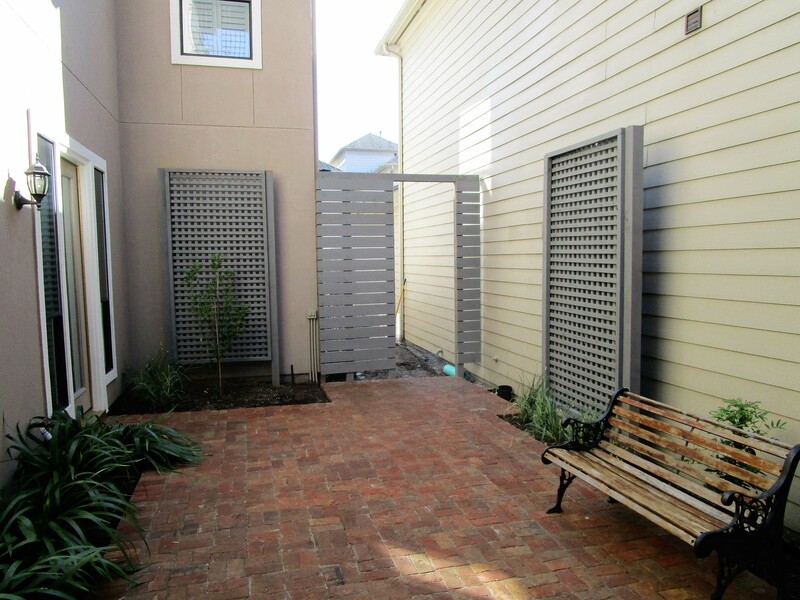 This garden space is in a gated townhouse community off Montrose Blvd. 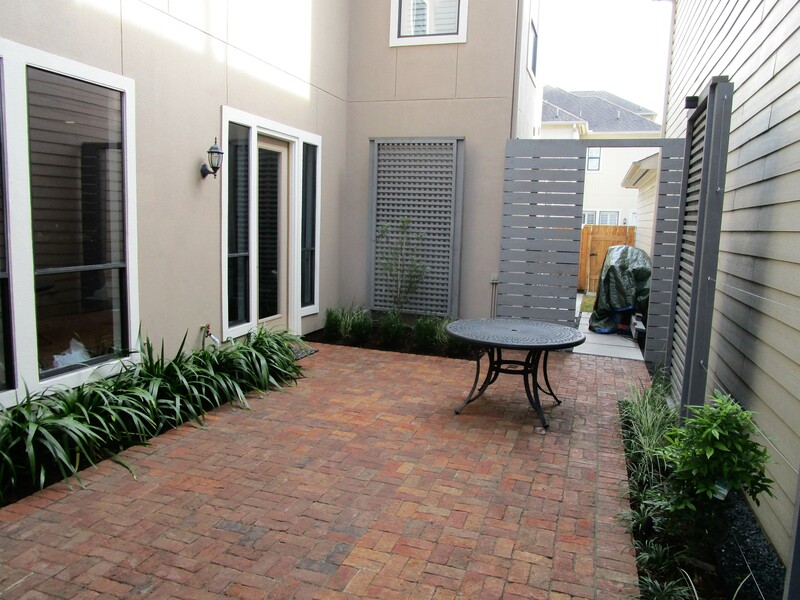 The space is a nice size for a courtyard but not really big enough for a lawn. 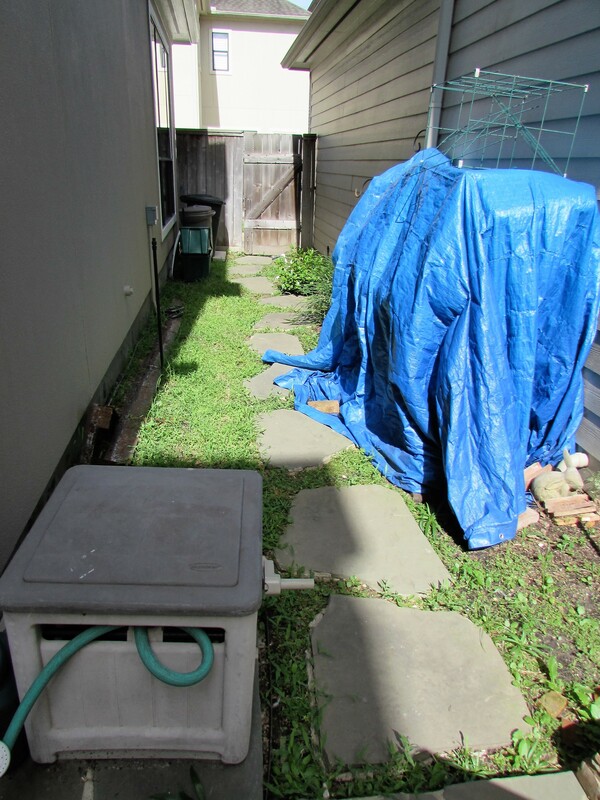 This is the before: What this lawn covers is the remnants of a series (yes, a series) of ponds which filled the courtyard. 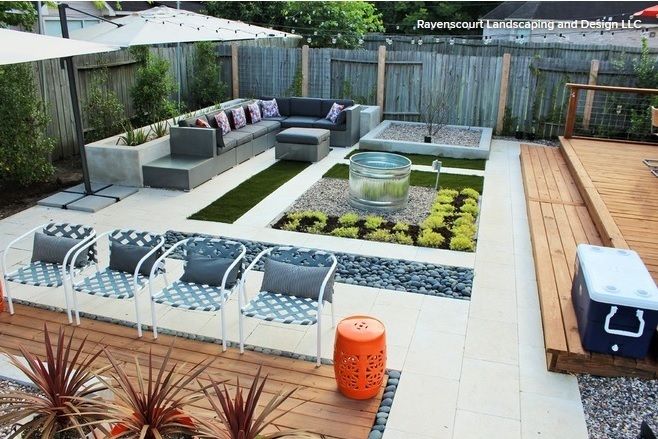 The grass serves no purpose for the clients and the tiny flagstone patio was too small to be of much use. The owners wanted a more organized and pleasing garden to enjoy from indoors from the wall of windows that looks out on to it. And, of course, while outdoors. We put up a privacy screen to create a storage area in the narrower part of the space. This is the before shoot. Out of sight from the windows, mostly, this side yard became the storage space for various objects. This perspective looks back toward the alley. Cement pads were used to create a walk way that takes you to the back gate. There will be a little shed just inside the opening. 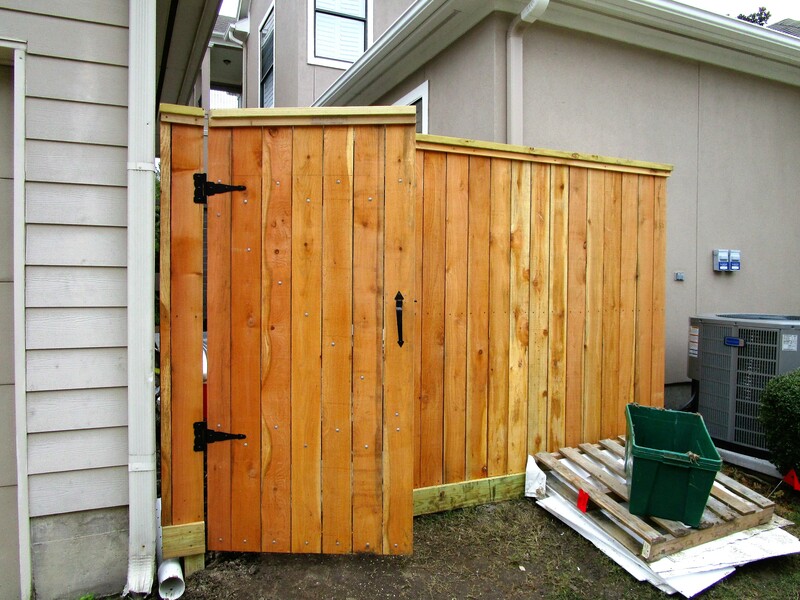 They talked about putting in a wrought iron gate that would match their front gate. The metal trough is going to be a herb and veggie garden. All that is missing beside cleaning up is the rainbow gravel. 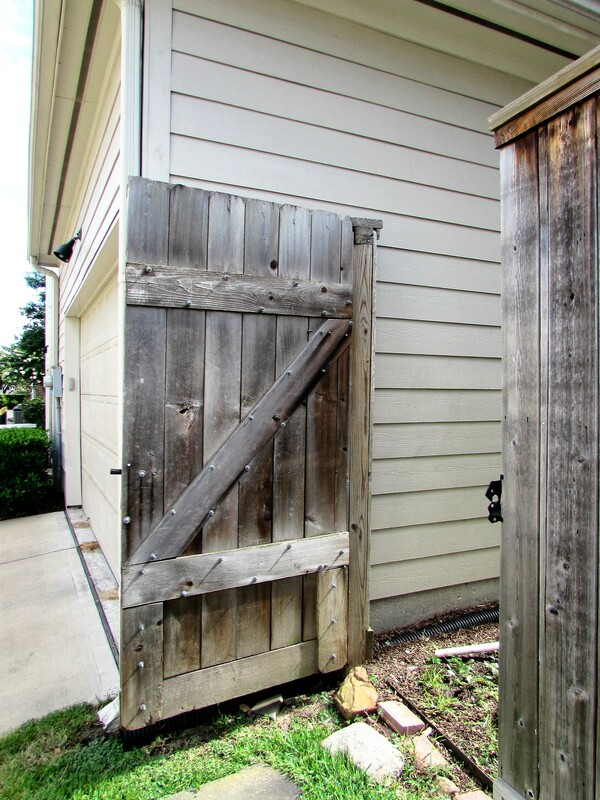 The back gate/fence was old and needed replacing. They asked us to bumped it out to allow for more space and create a place for the trash cans. Here is the new gate and fence. We used cedar because it stands up to the humidity better than pine. You can see we made it a bit taller too. 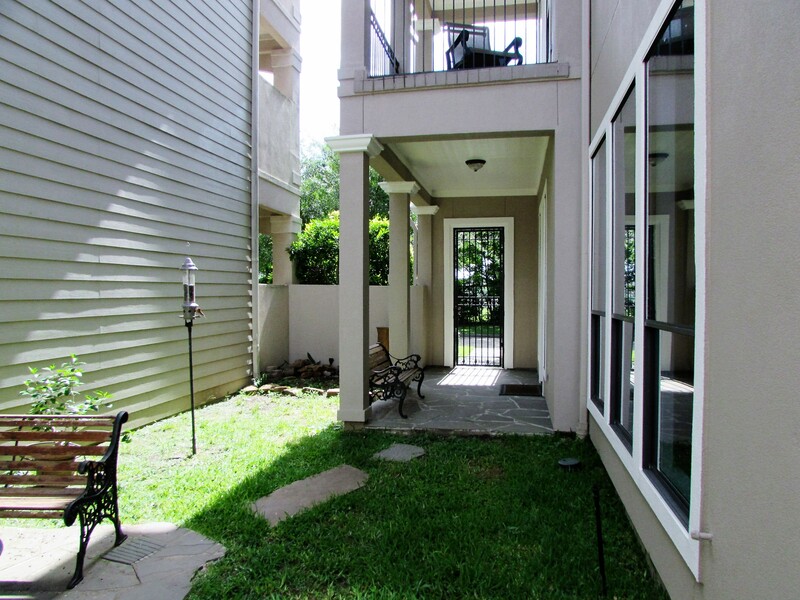 Space is at a premium in town-home living and we work to maximize it while also making it more attractive. We also kept the style consistent with the neighbors (this includes height as well as trim). Back to the inside. First we had to strip out all the grass, flagstone and debris. 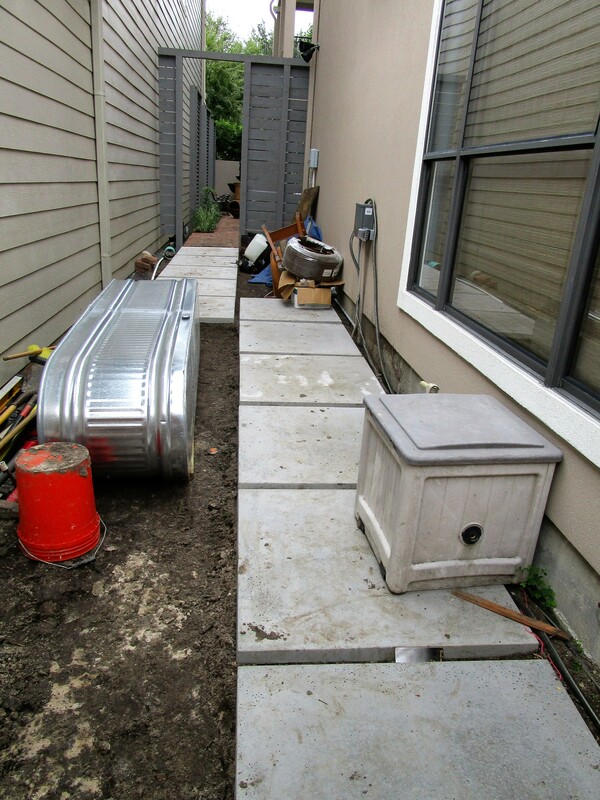 We then installed the drainage along the house (covered in gravel so that the whole channel becomes a point of collection). 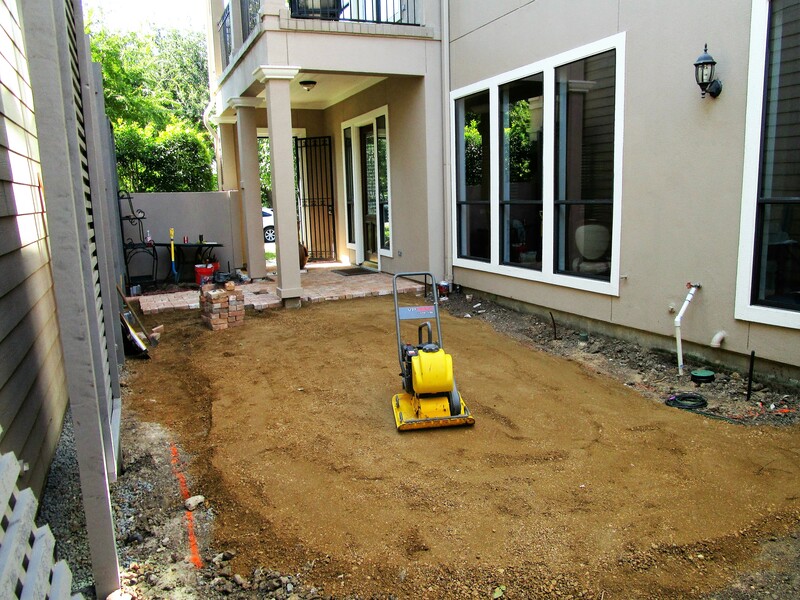 Once the area is clear we bring in decomposed granite and compact it as the base for the new brick patio. The irrigation is already in and so are the wooden lattice screens. 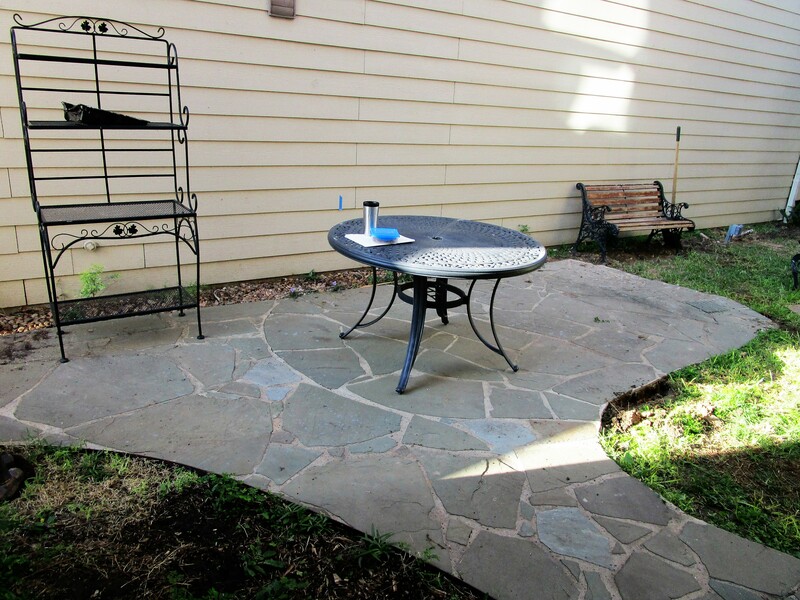 We removed the flagstone off the cement by the front door and were able to brick over it to make it match the patio. We have found we prefer setting bricks on a compacted base to using mortar. The main reason is because our clay soil is going to shift. It is far easier to repair this type of installation than one using mortar. 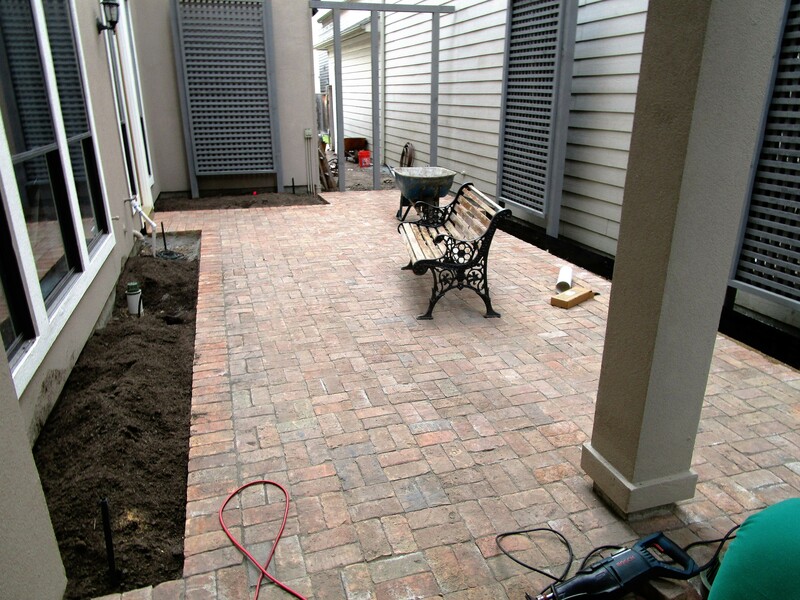 The finished patio is sealed with polymeric sand. The brick are handmade in Mexico. The owners found them and we have used them on a couple of other projects since then. I think they make a excellent substitute for old reclaimed brick. What do you think? This is the view from the landing. 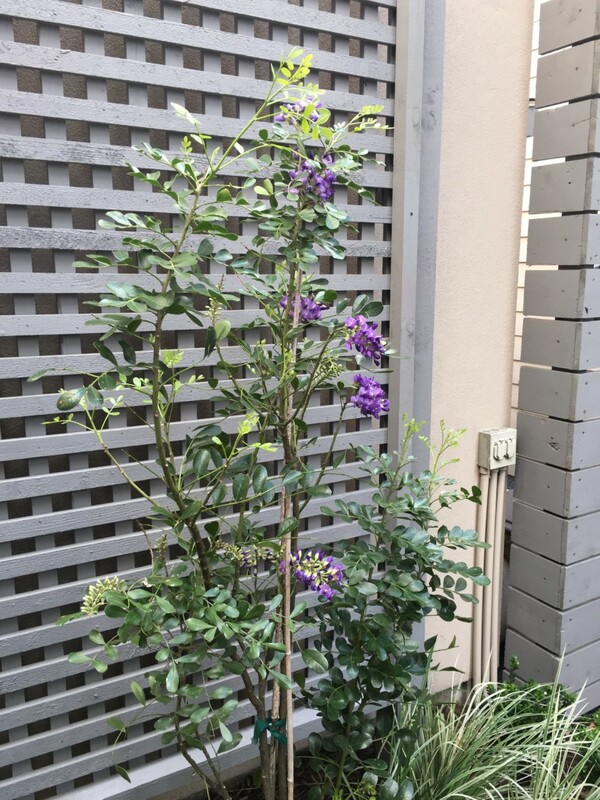 The plant palate is simple and once the wisteria grows in on the wire cable trellis between the two lattice and mirror panels the space will seem even more inviting. You might have seen us do this before. 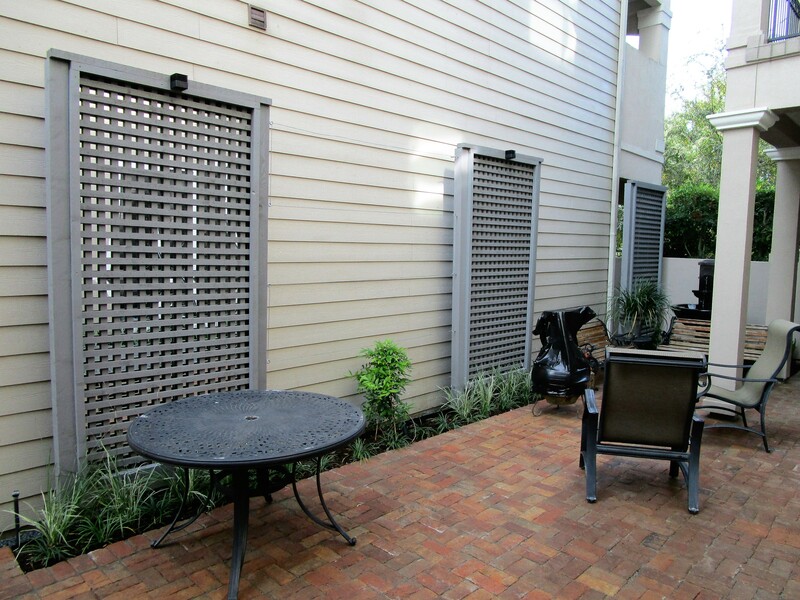 We put outdoor mirror panels behind the lattice to make the space seem larger and to catch more light. You can’t really see it in this picture but there is wire going between the panels to train the Evergreen Wisteria upon. This will create a nice green wall. The screen is directly across from a wall of large windows of the living and dinning room. I wanted to do something fun that didn’t take up much real-estate but would mask the boring side of the house next door. Here is a partial view of the windows. 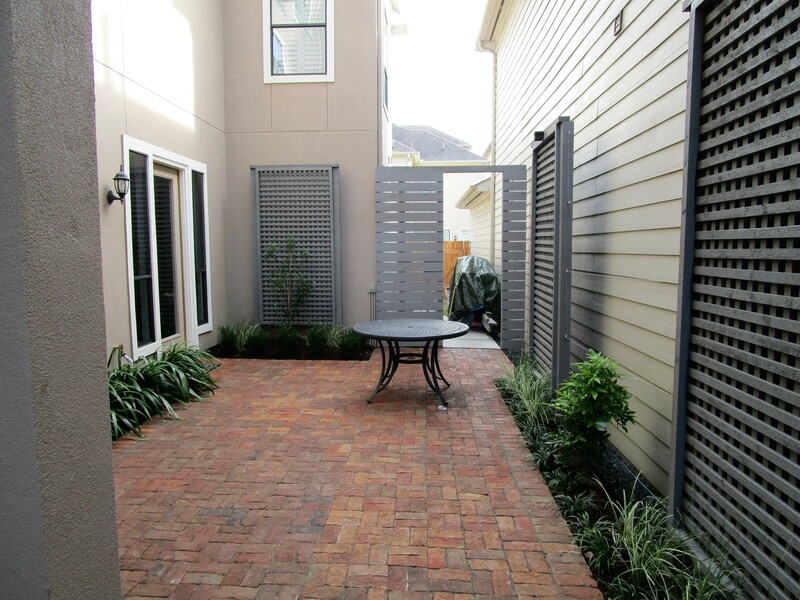 We added the other lattice screens as design elements. Under the big window we planted Giant Blue Walking Iris. They bloom from April to June and sometimes even longer. 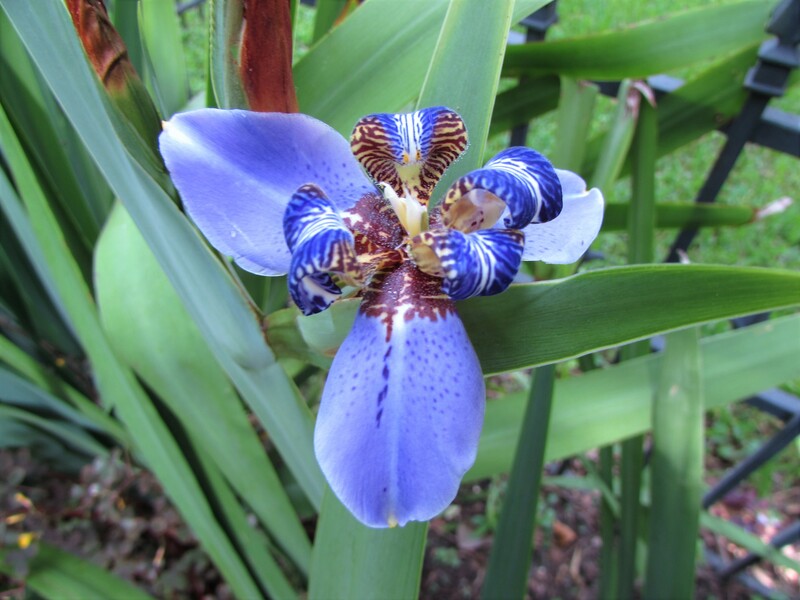 This is one of my top ten favorite plants because of the amazing beautiful blue flowers. Stepping back to get a wide shot. The single screen has a Mountain Laurel planted in front of it. It is under planted with Shooting Star Lilies, Anthericum saundersiae (‘Variegata’), another favorite of mine. We wanted the entrance to be very welcoming. 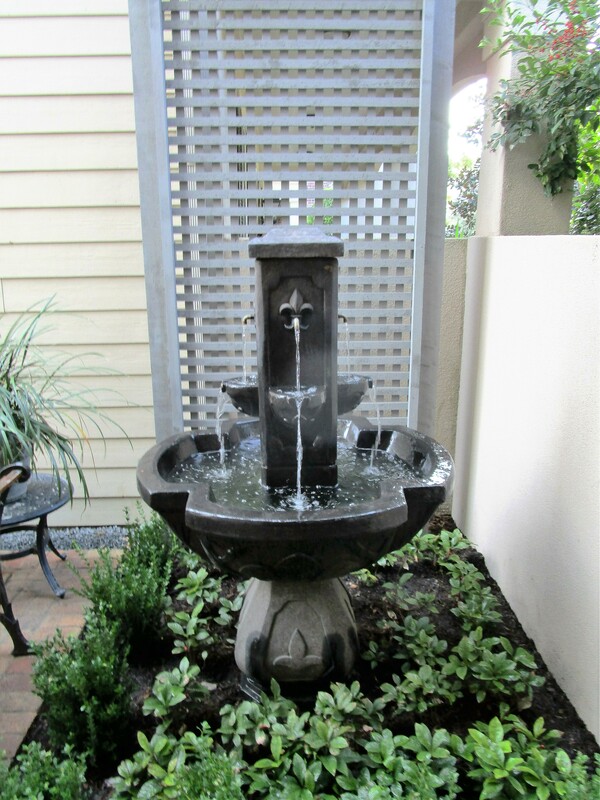 The space was really too small to sit in but perfect for a little fountain garden. The sound of water as you walk in is a nice welcoming treat. 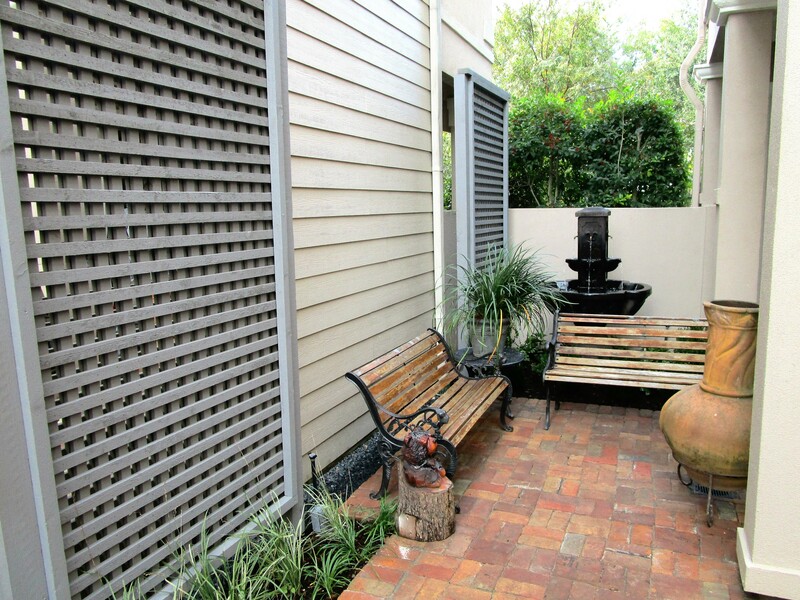 This screen is to give a bit more privacy from the neighbors front entrance and coordinates with the other 3 screens. We planted Baby Gem Boxwood surrounding a field of Sandy Leaf Fig Ivy. 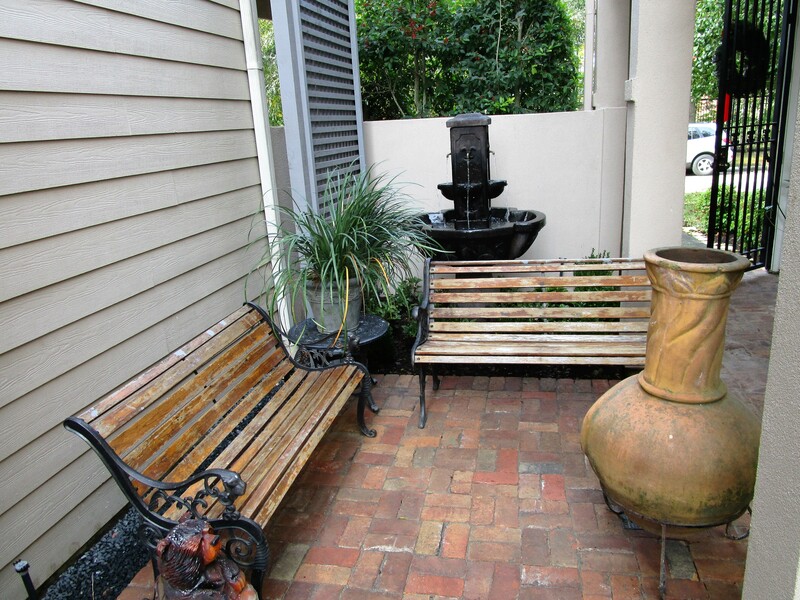 Using park benches they already have they have created a little seating area to sit and warm yourself by the clay chiminea and enjoy the fountain. We often leave the cedar lattice natural and let it gray. The owners decide they wanted a paint stain to give a cooler cleaner look. I love it! I took this picture when we first visited this space. 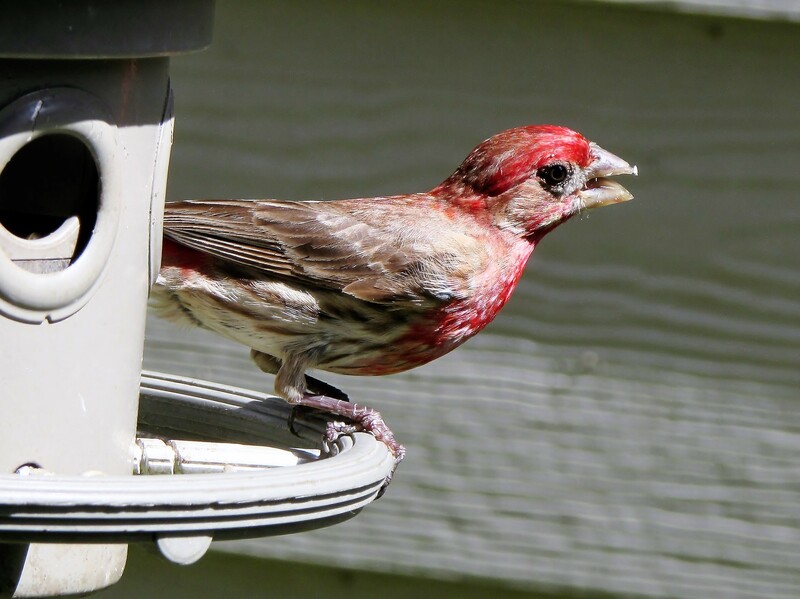 I am wondering what the Hollywood finch thinks of the new landscaping : ) I hope to add more pictures once they get their new furniture. Lovely! I love the bricks and the grey paint looks so smart. 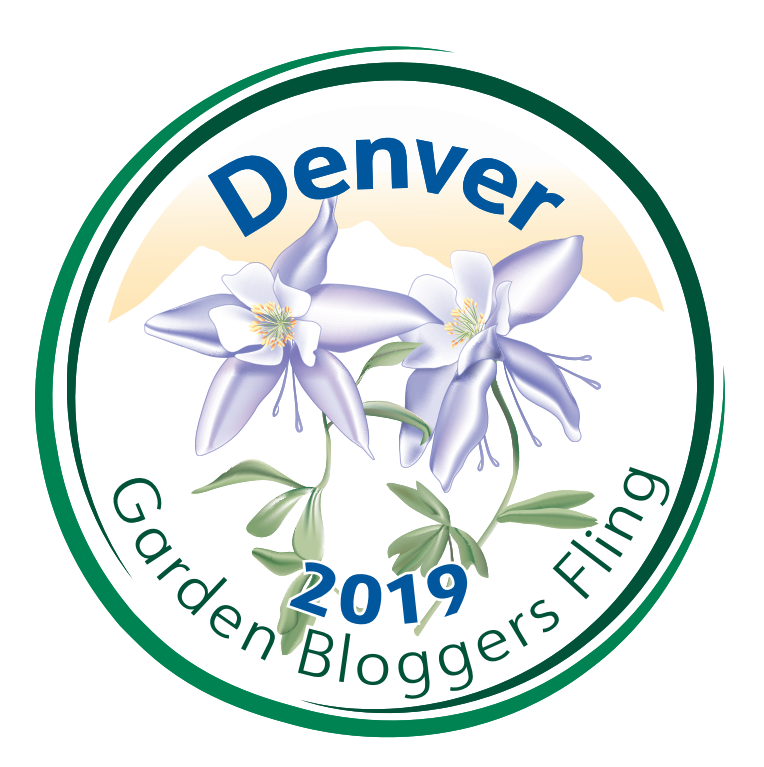 Is that pretty blue flower a Moraea? Thank you 😊 It is a Giant Walking Iris. The trellis mirrors add welcome height and interest along the walls too. I’d love to see you write a tutorial about how to make those. 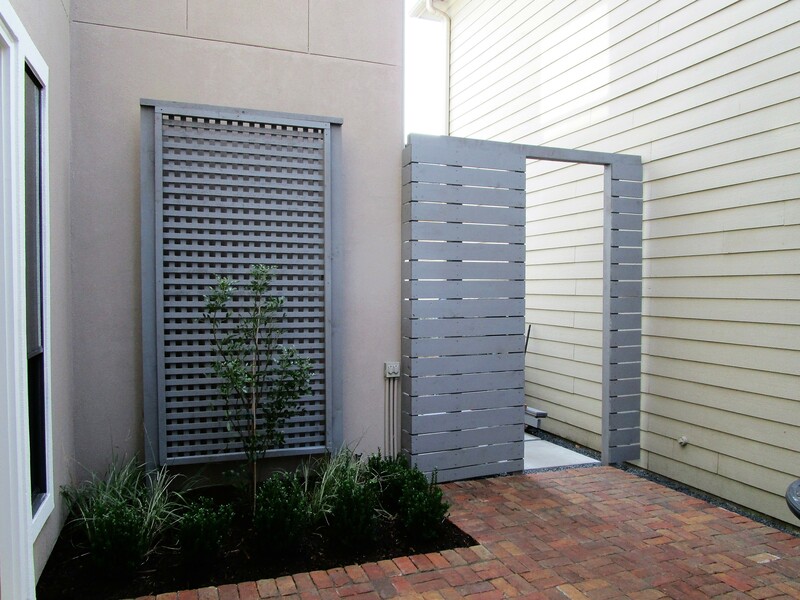 And I like that horizontal screening fence and doorway — tres chic! Bravo! I’m fascinated by these small urban spaces, even as I lust for more space. The bricks look great, and I love the Walking Iris. Thank you : ) it has become a fun challenge to bring so much to such a small space!